By the late 1990’s, security printers were under siege by an army of new digital reproduction devices. Desktop printers, scanners and photo manipulation software were all becoming affordable tools for the counterfeiter. Two can play at that game and the ‘Canadian Journey’ series was the first to be designed wholly on a computer. It was also the first to involve Canadian citizens in its subject choices. Many focus groups were convened to decide what values or achievements most reflected the Canadian experience and these elements, from the arts to pond hockey to votes for women, adorned the backs of all the notes. Like in 1954, the series design was the vision of one person. 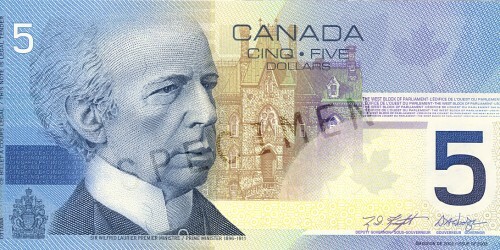 Canadian Bank Note art director Jorge Peral was charged with designing the entire note series. This could only be accomplished with the help of computers and their ability to provide multiple versions of a note or make changes instantly visible. What has resulted is a beautifully layered and highly cohesive note series, the $20 note winning ‘Bank Note of the Year’ for 2005 by the International Bank-Note Society. Even by the era of the Bird Series, the main security feature was no longer the intricacy or perfection of the engraving but in elements such as metal threads, holograms and watermarks. The ‘CJ’ bills have front to back registration, meaning that they must be shown to align absolutely via a semi-transparent number fragment that completes itself when held to the light. There are also hidden features only detectable electronically. Only the portraits were hand engraved, retaining a traditional look. The $5 note, issued in March 2002, was the second in the series. The face features a portrait of Sir Wilfrid Laurier produced by the noted Swedish engraver Czeslaw Slania and a vignette of the West Block of the Parliament Buildings. 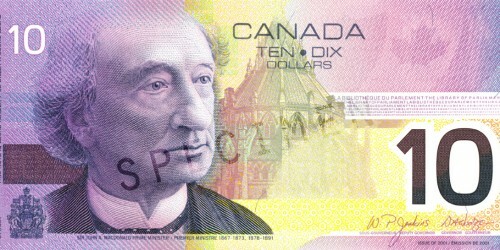 The face of the $10 note features a portrait of Sir John A. Macdonald engraved by Jorge Peral and a vignette of the Library of Parliament. 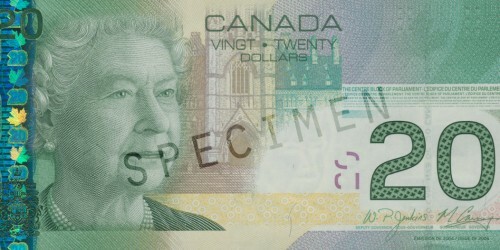 The $20 note, issued in September 2004, features a portrait of the Queen based on a photograph taken in 2000 by Charles Green specifically for this note. 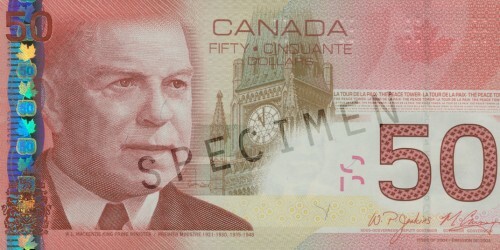 Issued in November 2004, the $50 note features a portrait of Prime Minister Mackenzie King produced in Germany by Giesecke & Devrient (a security printer with subsidiaries around the world and parent company of BA International Inc.) using a computer-assisted engraving process. 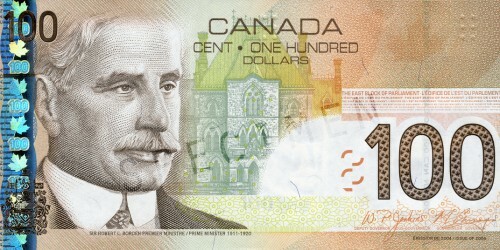 The portrait of Sir Robert Borden on the $100 note was engraved by Czeslaw Slania, based on a watercolour (above) by Jorge Peral.